Offer songbirds a rugged and dramatic abode with the Heartwood Windy Willows Bird House. This home's slightly rounded body creates an exciting silhouette, toped by the pitched roof with copper ridge and cypress shingles. A scored finish on the exterior of the home brings more dimension to it, and the brown, tan, and black hues enhance its natural theme. A 1.375" diameter entrance hole on the front panel enables small songbirds to use this roost, and the included metal hanger makes placing this home simple. Ventilation gaps beneath the overhang of the roof help regulate the internal temperature, and drainage at the base ensures the nest remains dry. The all cypress construction forms a durable and lasting home, for you and your feathered friends to enjoy. 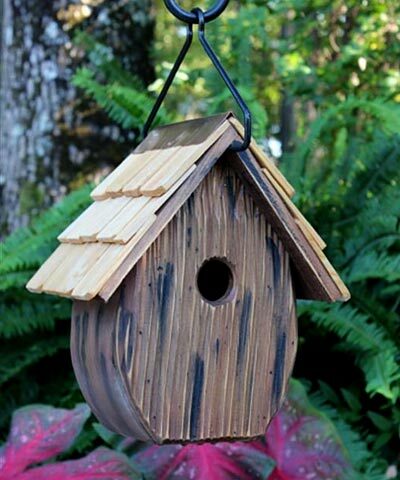 Update a classic garden accessory and watch birds in your yard using this Windy Willows Bird House. Made in the USA.